Google's digital music warehouse is here, and it's a lot more than just a store. 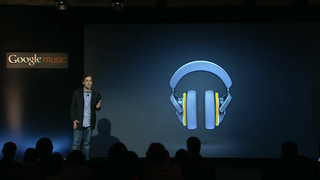 Open today, Google Music will also hold and stream 20,000 tracks in your library. Free. Too bad it's missing a giant record label. Google Music today is Google Music Beta of yesterday, opened up to the public, with a store added on. You can upload your existing music library straight from iTunes or any other folders on your computer to Google's cloud, where they'll be available anywhere you can get a net connection. Or, for the first time, you'll be able to buy music directly from Google to your phone (Android 2.2 or higher) or computer—as a 320 kbps MP3. Tracks will cost the expected $0.99 - $1.29. This is Google trying to catch up after a lot of years of not selling music. The store will push heavily curated (I hate that term) music suggestions, directly from Google's band of music nerds who apparently have musical taste you'll want to emulate. Sharing also extends far further, into—you guessed it!—Google+. When you buy a track via Google Music, your Plus friends (if you have any) will see it, and be able to stream it for free. So how about that music lineup? Sony, EMI, and Universal—yup, no Warner, and that's a major shortcoming. A bunch of indie labels are onboard, but, yeah, no Warner? Big ouch. Google is touting "exclusive" music in an attempt to allure—Busta Rhymes' next album, for example—but that's no way to compensate for an entire chunk of the music industry missing. I'll take Amazon and Apple over XXXCLUSIVE TRAX from Dave Matthews Band.